This combo pass allows you to see two of San Francisco's most popular attractions. 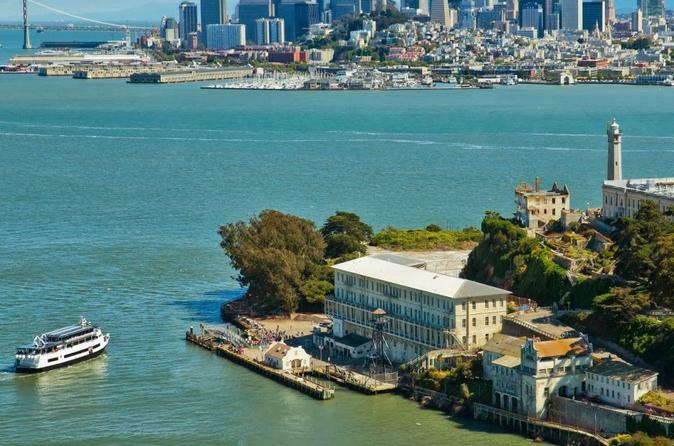 Visit Alcatraz Island, a former federal prison that housed some of America's most notorious criminals, and the Aquarium of the Bay, home to over 20,000 marine animals, including sharks, rays, sea stars, river otters, and many more. Head to Pier 33 thirty minutes prior to your designated cruise time and board your ferry to Alcatraz Island. Upon arrival at the island, you will be taking part in an award-winning audio tour called "Doing Time: The Alcatraz Cellhouse Tour," featuring actual correctional officers and prisoners who lived and worked on the Island. Watch an orientation video by Discovery Channel or join ranger and docent tours. Relax and enjoy its historic gardens and abundant wildlife. You'll step back in time and experience the legendary island that has been a Civil War fort, a military prison and one of the most notorious federal penitentiaries in US history. You are free to stay on the island until the last ferry departs back to Pier 33. Before or after your Alcatraz visit, arrive at Aquarium of the Bay, located on San Francisco’s bustling Embarcadero. Head inside with your general admission ticket and begin your self-guided exploration of the aquarium. Your admission allows you to visit the aquarium’s main exhibit areas. With a focus on the marine life of San Francisco Bay and its surrounding bodies of water, the Aquarium of the Bay is home to 20,000-plus animals that live in 700,000 gallons (2.6 million liters) of carefully maintained bay water. Stay at the aquarium as long as you like to learn about sea creatures like jellyfish, octopus, and sharks. See orange garibaldi, green moray eels, colorful rockfish, and other wildlife native to the San Francisco Bay. Learn about how anchovies stick together and avoid predators, and find out how the bay acts as a breeding ground for perch and many other fish. Walk through a 300-foot (90-meter) tunnel system of clear glass for a look at the fascinating fish and other sea life in the bay and nearby Pacific waters. See mesmerizing jellyfish, a giant Pacific octopus, graceful rays, sturgeon, and multiple local shark species like sevengill sharks, leopard sharks, soupfin sharks, and spiny dogfish.